When an all girl band hit the stage on AROB day with their version of Sharzy’s “Meri Buka,” the crowd responded like they should. Led by mother of two, Dianne Biaun Lavi, the girls belted out their rendition, calling it “Mangi Buka” instead. Now, all over Facebook, the girls who pulled together to do the performance are still reeling from that one live gig which is perhaps one of their biggest achievements so far. Dianne, 31 from Yangoru, East Sepik, works as an electronics instructor at Port Moresby’s Don Bosco Technological Institute (DBTI). She plays guitar and is the oldest member of the group. The daughter of an ex-soldier, she was born in Wewak and played with church youth groups and school bands in high school. The band members are a collection of DBTI students. Each influenced by reggae and Pacific infusions of reggae music. 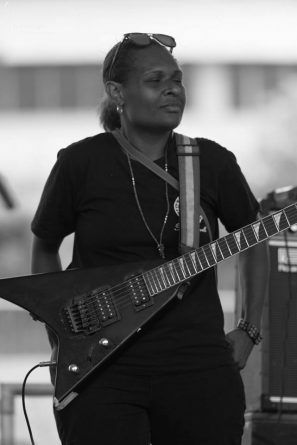 Two of the band members – Lead singer, Patrina Kabonga and keyboardist Helen Dapue, previously took part in the John Wong Tribute concert. A reggae song in Tok Pisin with an infectious, intoxicating rhythm, it carries with it a strong anti-violence message. It describes the love of a Papua New Guinean woman for her man and the distrust that can destroy it. This song was the surprise for those who attended AROB day. Nobody knew Mereani Masani was in attendance. “I think some people thought she was just playing when she said that,” Dianne said. From the performance, nobody knew about the battle against the nervousness and anxiety that the girls went through before the performance with one of the finest artists out of Morobe. “We had only one practice on the Friday before AROB day. They were all nervous. I just said, We can do it. 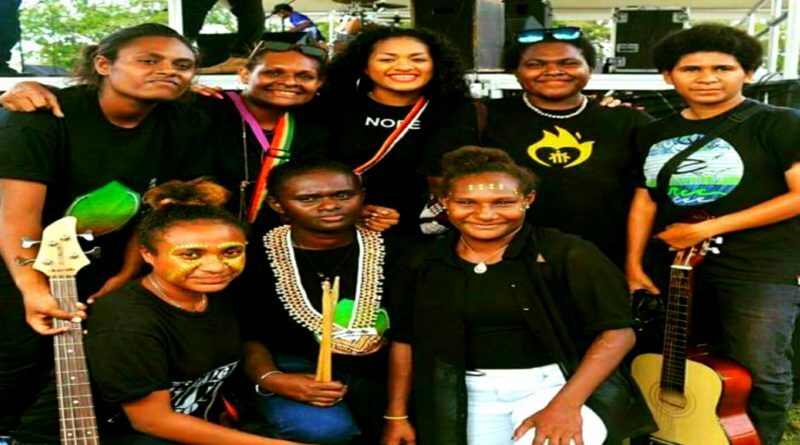 While they did have a boost of confidence, the success of Mereani’s Bossman blo Lewa” was hinging on the bands timekeepers, drummer, Abigail Maiha and bassist, Lisa Ainui. Their skill in the parts that kept up the rhythm and the bass fills for Mereani’s toasting (Jamaican style, lyrical chanting), were crucial if it was going to rock the crowd. For this girl group of students and teacher, their band is part of a bigger message. “I hope we can inspire young girls in a small way to break the barriers and come out. I am a strong believer that Papua New Guinean women can work together. “Life is too short, if you have talent, you have to use it.